The list of resources for startups in the food and agriculture industry is growing. In August, we reported, along with AgThentic and AgInnovation Development Group, that there were 77 programs — from accelerators to incubators to pitch competitions — available to startups in the agritech sector in the Guide to Startup Resources in Agriculture and Food Technology. We have now updated this report to 90 resources; some we missed the first time around and some of them have launched since the report was published. It’s clear that the ecosystem is growing, as everyone from colleges to lawyers to incumbent firms are getting excited about early stage innovation in food and agriculture. They are launching programs to support startups but also to try and grab a piece of the action. There is still a clear gap around commercialization: exporting research and innovation from universities into market products remains a challenge, and innovators lack support in crossing this chasm. While it looks like the startup resource ecosystem in food and agtech might be becoming a little overheated, particularly on the accelerator side, there is still room for initiatives to help close this gap. The variety within accelerators, and across the landscape in general, illustrates the need for more clarity around the types of resources that exist (or should exist!) and consistent language to describe how they help startups at different stages and with different challenges. We proposed definitions in the report and we are seeking feedback as we hope to make these definitions the gold standard for the industry. Startups should not have to spend time figuring out what an “accelerator” is; rather, they should be able to quickly find the most applicable one for their business and start applying. Please let us know your thoughts by emailing here. Accelerator: a set duration program where a cohort of selected early-stage companies gets access to a business development curriculum and mentor/advisor network. Accelerators often result in funding for participating startups on a set or negotiated basis. This is probably the best-known type of resource and has the largest number of individual resources, according to the report. Corporate Incubator: this provides startups with access to capital and the wider resources of a corporation. Participation in a corporate incubator can often lead to the corporate in question acquiring the startup. 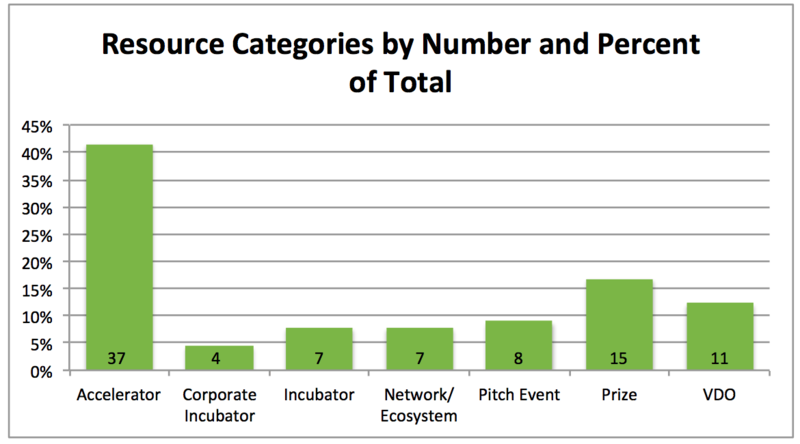 Interestingly, all the Corporate Incubators identified in our report are focused on food, rather than agriculture. Incubator: a physical workspace or lab that provides support such as technological expertise and mentorship; no fixed duration; rolling acceptance. Network/Ecosystem: a platform, often virtual, that provides access to resources such as mentors, investors, and research. AgFunder is a good example of a network/ecosystem that provides a go-to location for news and information about the sector, offers support to the startups that come into its platform, and facilitates partnerships within its network. Pitch Competition: a one-time event, usually focused on connecting startups to investors. A great way for startups to get quick feedback and some free (or at least cheap) PR. Prize: a competition, usually culminating in a pitch event, with monetary reward. Venture Development Organization: often regionally focused, VDOs have ties to corporations, universities, and/or government and perform commercialization functions either as a service or by licensing IP. This is quite a varied category with organizations ranging from consultants to quasi-venture capital firms. If you have any suggestions on how to split this section out better, please let us know. We have also noticed a few “hands-on” VC funds that are positioning themselves as accelerators, such as Radicle, Sonoma Brands, and Ceres 504 to name a few. Where would you put these? Are they purely VC funds? Help us put definition to this increasingly diverse and complicated world of startup resources for the whole sector by getting in touch here. As an additional Agritech resource, I’d suggest http://theherdlocker.com/tweet/popularity/agritech Based on the hundreds of thousands of #agritech tweets already processed, noise is a little over 90% of the conversation. The platform filters and ranks the most popular shared content in realtime. Agritech’s zeitgeist, you might say. It’s been running for over a year, monitoring half a billion tweets a day, tracking dozens of topics. It will always be free to use. No ads. No BS.